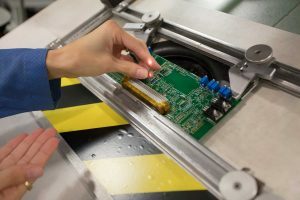 While we pride ourselves on the use of using cutting-edge technology in our PCB assembly processes, we also maintain the infrastructure to support mature, through hole PCB designs for customers who maintain legacy products. Our through hole assembly equipment includes six Contact System CS-400 semi-automatic component locator machines that facilitate repeatable, process-controlled builds from 1 piece to 1000+. Our technicians are highly experienced soldering operators certified to IPC-610 and the J-STD. This wealth of knowledge increases efficiency and quality and makes us a first-choice supplier.